The City Wolf Pack welcomed its newest member, President Professor Sir Paul Curran at the Sports Leaders’ Tea. Marking the third instalment of the Sports Leaders’ Event, the Wolf Pack welcomes back new and returning sports team captains and introduces them to senior members of City staff ahead of the new season. Bill Thompson, Head of Sport and Professor Sir Paul Curran delivered speeches showcasing City’s sporting success, which has included gold medal triumph in rowing, representation in athletics at the Commonwealth Games and back to back Varsity victories over Kingston University. Captain of the Men’s Rugby team, Ed Armitage, (LLB Law) and Students’ Union Sports Officer, also delivered a passionate rallying cry to his fellow captains for the year ahead. 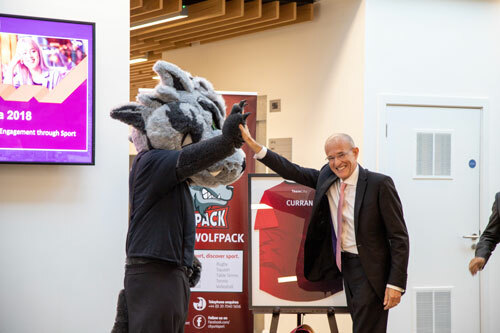 Professor Sir Paul Curran was presented with his very own Wolf Pack jersey, to celebrate City’s commitment to sport which last year saw 6,000 students involved in sport and physical activity and 468 students represent City in competition. “It is great to see how the sports programmes have developed over the past few years and hear the success stories that City has had – hopefully we can be one of those stories next year! “Playing volleyball and sports in general is what I look forward to the most each week. I find it really helps me relieve stress from essays and exams and I love getting together with the team, as we are all friends and we help each other on and off the court with studying. “We have 16 people each on the male and female team and last season we finished third in our league, so we are going to push for first this year. The main competition to beat is Sussex and we play them next week.